The Roland US-20 is an A/B switcher that allows the performer to switch his/her GK equipped guitar to two GK synths (one, the other or both synths at the same time). 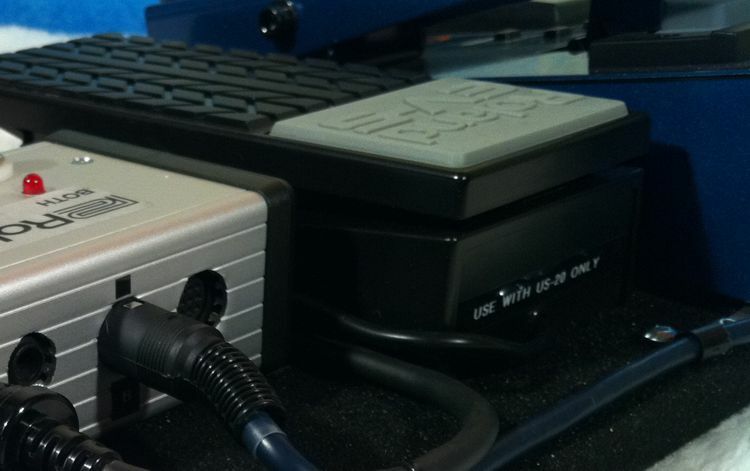 This US-20 Clone was designed by Roland enthusiast Harald Milz of Germany. I purchased the PCB from him and sourced all of the parts locally to put it together in my own custom packaging. GUITAR IN - allows you to RETURN the output of your externally connected effects to the GR-55 OR to connect your normal guitar to the GR-55 and use the GR-55 FX. The S1/S2 and GK Volume break-out of the US-20, to two external footswitches and an EV-5, allows foot control of those functions. These mimic the GK pick-up S1/S2 and Synth Volume, so, that in a Guitar with a Graphtech Hexpander circuit board, the extra holes for these functions did not need to be drilled. 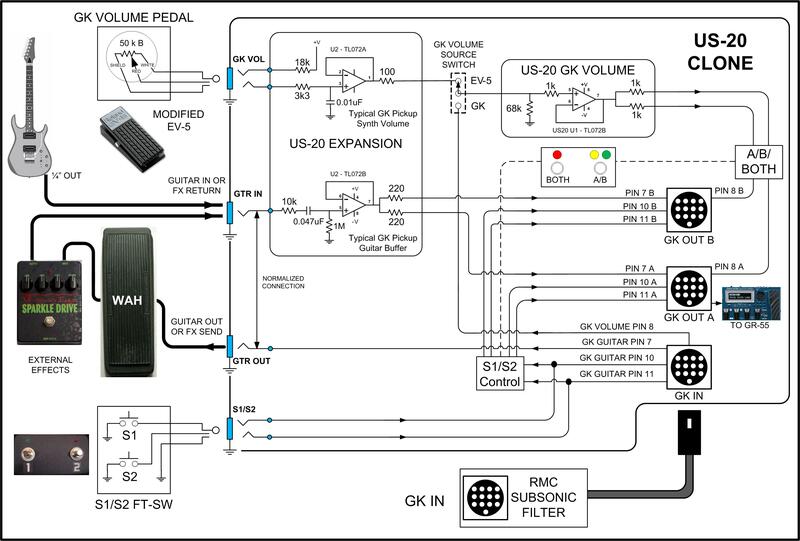 If the user does have a guitar with a Roland GK-pick-up, the small RED toggle switch on the US-20 clone allows the use of a standard GK Pickup for GK Volume or the external EV-5 for GK Volume. Up until the GR-55, all Roland Guitar synths incorporated a low pass filter to cutoff any low frequency information that is un-needed for the pitch detection circuitry. This previous filtering allowed the use of the Roland GK-pickups and aftermarket piezo-pickups developed by other companies like Graphtech and RMC. The exclusion of that filter on the GR-55 meant that the use of piezo pickups to drive the synthesizer would result in subsonic frequencies and piezo-to-piezo crosstalk that would in turn result in mis-triggering of the GR-55. RMC pick-up founder Richard McClish produced a solution. His G5-SF-001 Subsonic Filter was designed to install internally in the GR-55; between the 13-pin Input Jack and the Input circuit board. I rehoused the circuit board with a short section of 13-conductor GK cable into a die-cast aluminum box that was easy to mount on the pedalboard. I did this because I wanted the filter board at the input of the US-20 GK A/B Switch so that any guitar synth downstream would benefit from the subsonic filtering.